Catalogue produced to celebrate the launch and inaugural exhibition at The Black-Art Gallery, Finsbury Park. With statements from the participating artists and the organisers. 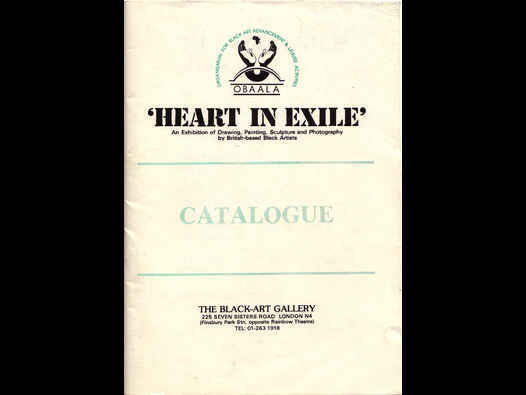 Heart in Exile featured work by Tyrone Bravo, Vanley Burke, Pogus Caesar, Dee Casco, Eddie Chambers, Adrian Compton, Shakka Dedi, Olive Desnoes, Terry Dyer, Carl Gabriel, Funsani Gentiles, Anum Iyapo, George Kelly, Cherry Lawrence, Ossie Murray, Pitika Ntuli, Joseph Olubu, Keith Piper, Barry Simpson, Marlene Smith, Wayne Tenyue and someone going under the name ‘Woodpecker’.